Selling your RV, travel trailer, toterhome or fun mover can be difficult. In fact, it may be quite overwhelming. We offer RV consignment sales at Fun Motors. We advertise and sell the vehicle for you. We either keep a percentage of the sale, or you can name a sales price and we'll take any offer over your asking price. You choose how we sell the vehicle. When someone is purchasing a used travel trailer, they often seek out RV dealers for the benefit of financing, extended warranties and trade-ins. It's very hard to sell an RV outright when there are so many dealers offering these services. We will do the advertising for you! We sell locally, statewide, nationwide and in some cases internationally. We sell a lot of RVs to Canadians. We also advertise in newspapers and magazines. We are located minutes from the airport! Most of our buyers come in from Austin, Houston, Corpus Christi, or even other states. 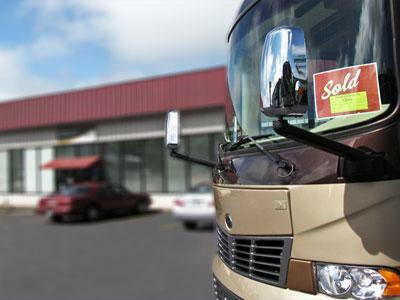 We have the experience and trust to help get people to come so far to buy a used RV. The fact that we are near the airport helps! It can be a challenge to get buyers to fly into San Antonio when dealership is in an entirely different city!! This is not a problem for us we are in San Antonio, minutes from the airport and centrally located. We make pick up easy! Thats right. If you're in the market to sell, we will drive out to evaluate your RV. We will even bring a driver along to take it to our lot for you! You won't have to go through the hassle of hooking it up, or jumping the travel trailer, or finding a ride back. We want to make this process as easy as possible for you. We take our security very seriously, our fenced property has surveillence cameras, people living onsite and it's well lit. Selling an RV is easier said than done and there are a lot of "lookers." Many people want the added comfort of an extended warranty - and we can provide that to our clients. RVs are a big investment, you have a much bigger market if customers can have a trade-in or apply for financing. We have tools available to us that you may not have. Marketing for a single used RV can be expensive, instead we market many travel trailers at once and save. Fun Motors has a website and a trusted reputation. Customers know exactly what they will get when they come to us. Potential buyers want to work with their schedule and it may be hard to shuffle yours to accommodate. When you sell an RV, there is a lot of paperwork. We are licensed and bonded to handle it for you. If there is a question or problem down the road, then the buyer comes to us. 2. You can name your sales price and will accept any offer of your asking price. Why would we offer you the second option if there is possibly nothing over your price? Purchasing an RV is a big investment, many buyers need financing, parts, accessories, storage or they require financing. All of which we provide. No hidden fees, no games. Give us a chance to sell your RV for you. Please feel free to call us with any consignment questions you may have at (210) 520-9500.